In this tutorial I will learn you how to install Odoo 10 community or enterprise on Ubuntu 16.04. The script that you will use is based on the code from André Schenkels but has been updated, upgraded, improved and I’ve added Enterprise support. Do notice that if you want to install the enterprise version that you will need to be an official partner or that you need to have bought the Enterprise subscription from Odoo. Otherwise you will have no access to the Github repository for the Enterprise code! Tip: always modify this for every Odoo you install! 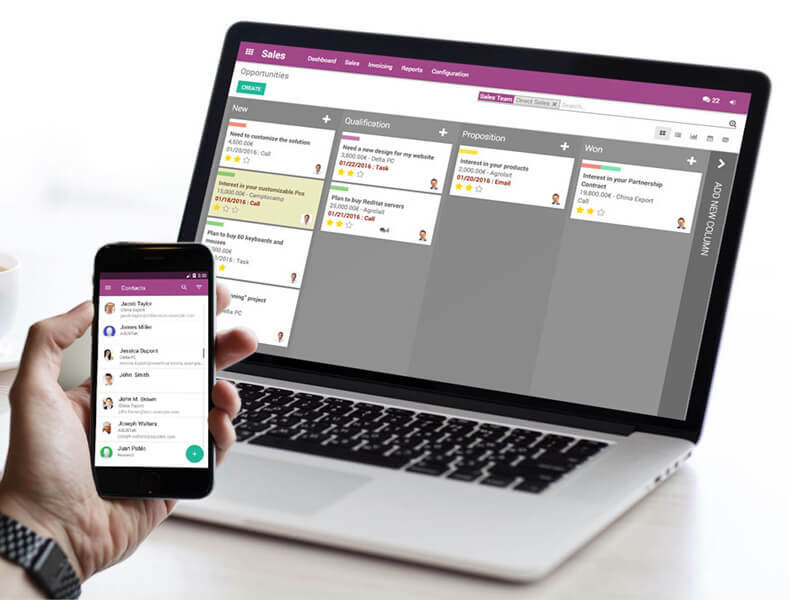 You now have a fully functional Odoo V10 community or enterprise on your system! Congratulations. Since Odoo Enterprise uses code from both http://github.com/odoo/odoo and github.com/odoo/enterprise we will separate the code with this script. This will make future upgrades easier and the code is nicely separated. This means that the default V10 code will be under /odoo/odoo-server/ and all the enterprise code will be under /odoo/enterprise/. In the script you saw there was an option to change the Odoo port (OE_PORT). When you’d change this port number to 8070 in the install script it would be applied to /etc/your-config-file.conf and this would give you the ability to change the default port. As per odoo, it’s recommended to run on this version. If not, what is the required steps to replace v9.5 with v9.6? Thanks! You’re welcome! It won’t be auto-updated, you will need to download the updates (sudo apt-get update) and then install it. The recommended version is still 9.5, both for Odoo 9 and Odoo 10. Any special difference on Odoo 10 Community? You’re welcome! There aren’t a lot of differences between V9 and V10 community. An overview of all changes can be found here https://www.odoo.com/page/odoo-10-release-notes and they’re also labelled so you know if it is for the Enterprise or Community version. Awesome stuff! thank you very much! Thanks so much Yenthe! You are a life saver! can i use V10 with Ubuntu 14.04? Yes you can, without any problems! However I mistyped my paswoord of my Github account to fetch the enterprise sources. The installation script proceeded with the community version. Should I upgrade via the Odoo interface or can I upgrade via the command line? Just went with the safest option; reinstalled the ubuntu server and re-ran your script. Thanx again for your script! You should be able to just run the script again and it should fix everything then. You will see some warnings about directories already existing etc. Great stuff! Does the script work on Debian Wheezy and/or Jessie? Thanks! The script will not work for other Debian versions since they work differently. The script works out of the box on Ubuntu 12.04, 14.04 and 16.04 however. Hi Thank you very much for a great install script. However, I will I be able to keep my Odoo source code up to date as they pass new changes? Is it possible to automatically upgrade version 9 to 10? If not, is it possible to migrate the database? You’re welcome! By default there is no automatic method to upgrade your Odoo version from one version to another. You’ll either need to use the upgrade service from Odoo (upgrade.odoo.com) or use the open source OpenUpgrade alternative to do it yourself. Can you kindly give me an idea of how this open source openupgrade works? A script or a step by step how to with maybe pictures or commands would be very helpful. The official tutorial is very confusing and i have never been successful with it. I’m sorry but at this point I have no tutorial or step by step guide. The official docs are indeed confusing and do not clearly explain on what you should do.. I guess this might be something to add for me on the planning. Did you prepare a tutorial on how to use the OpenUpgrade script for Odoo base add-ons and custom add-ons? At this point I have no tutorial about it. It is on my to do / wishlist though! Thank you for providing this script. This script supports Community Edition? No problem! The script works fine for the community edition too, just set is_enterprise to false! Your installation guide looks so great! I am new to odoo and would like to try it on a mac running on El Capitan. Do you happen to have an installation guide for it? Thanks a lot! I don’t have a script or installation guide for Mac at this point I’m afraid.. sorry! do you also have an ‘uninstall script’ for Odoo 9 or 10? I’m sorry but I don’t have an install script at this point. I tried the script on an IP based installation and couldn’t get it to work. Before I pay someone for enterprise does this include the studio and digital signatures module? Yes the Enterprise license includes Odoo studio and the digital signature module! On top of all extra possibilities. why did you delete my question? about enterprise? its very valid for this thread. does this have the enterprise modules like voip and studio? I’ve never deleted it, it was in a queue. 🙂 VOIP is also in the Enterprise package by the way. I’m trying to run Odoo 10 community from nightly source. I download the source files, I decompress it in a directory and I want to run it in a terminal from this directory. But I don’t see this file in the downloaded files. Where is it??? How to run Odoo 10 community directly from the source files without using a install script? The odoo-bin.py file should be in there (https://github.com/odoo/odoo/blob/10.0/odoo-bin) and can be used to issue all the commands such as the -u parameter. Nothing beats a good old installation from Github directly though! i try in Enterpraise. why error? This means that you’re either not somebody with access to this repository (you’re not a partner) or that you didn’t have internet. Database creation error: new encoding (UTF8) is incompatible with the encoding of the template database (SQL_ASCII) HINT: Use the same encoding as in the template database, or use template0 as template. When installing ODOO10, can the postgres database from an existing ODOO9 be used without changing anything? Or is there any migration needed? Hi Peter, this is not a problem. When you’ve got two different postgres users and two different Odoo’s running on another port it’ll work just fine out of the box. Great tutorial and script, very easy to follow and set Odoo with your method. Thank you for taking the time to put this together Yenthe666, great work. Tried to modify the script to install Odoo v9 with Enterprise on Ubuntu 16.04, but it didn’t work correctly. Can you provide a script for installing v9 with Enterprise on Ubuntu? I do have access to the Enterprise repository, and your script worked perfectly for v10, just not v9. Thank you. Thank you for share, there uninstall scripts. You’re welcome! At this point there is no uninstall script, sorry. When creating the superadmin user ODOO what password the script put to the user? i setup multiple database with this install. do you have a write up on how to reach this domain using subdomain with nginx ? At this point I don’t have any tutorial for Nginx or subdomains, sorry.. You should create virtual hosts which you map to a specific port and domain in order to archieve this. Are there prereq’s for the install? Apache? or something else? The requirements are installed by the script, you don’t need anything before you use this script. Your script is very nice and easy to install, but do you think you will consider to make a script to use Nginx to install the server? Thank you! It is in my wishlist, I just haven’t come around to it. It takes quite some time and since I do it for free & open source I’ve got to set priorities to what I do first. 😉 Sorry! If you don’t have access to the Github repository you’ll have to use the nightly / installer. i installed enterprise v 10.0 with your script. the script ran fine. the only thing I changed was to Set Enterprise = True. Please have a look at your logfile under /var/log/your-odoo-name. The issue should be logged in there. Do you have acces to the repository though?(Github.com/odoo/enterprise). If you don’t have access to this repository this’ll the source of your issue. I have buy the enterprise version, i have the code from odoo. I need to upload something on github? Just update your Odoo instance and try it again, it should work then. The easiest way is to navigate to the URL where it is installed for. For example localhost:8069. If this doesn’t work you should have a look at the Odoo logfile under /var/log/your-odoo-name. thanks for the script first of all. I installed and it was smooth going but when i go to the site it says this site cant be reached.i check the listening ports and odoo isnt there, any help would be good, thanks. Have a look in your logfile under /var/log/your-odoo-name/ if there is an issue it should be in there. This has been fixed in all scripts now! Thanks for the feedback! I’ll try to fix this as soon as possible. You’ve probably had incorrect credentials for cloning the enterprise folders from Github or you’re not an official Odoo partner. In this case you can’t install an Odoo Enterprise. Do I rerun your script? cp odoo/odoo-server/odoo? or something completely different? Nevermind 🙂 I ended up rerunning your script with modifications: renaming odoo to odoo10 so as not to interfere with my initial install, used a dif port, and then I made changes to my nginx sites-available to upstream the odoo10 with associated port and everything is working well. Happy to hear you’ve got it working! This is indeed the way to set up multiple Odoo environments on one server. Your script is awesome, everything work like a charm ! However, i’d like to know how i can redirect a subdomain name to the 8069 port used by Odoo ?? I try VirtualHosts in Apache2 conf but it says that socket is already in use ? (excuse my lack of knowledge…). My script doesn’t use apache (as you stated). You might want to look at Nginx configurations to do this. Have a look at the official docs from Odoo about HTTPS/Nginx https://www.odoo.com/documentation/10.0/setup/deploy.html#id7 and at https://stackoverflow.com/questions/9905378/nginx-subdomain-configuration for example. You most likely do not have access to the Odoo Enterprise code then. Can you access github.com/odoo/enterprise and are you an Odoo partner? Otherwise you won’t be able to download it. Hi Thank you very much ! But when I finish the installation, the link that I have guide me to the page of manage databases not to the interface of odoo . Please check your logfile and configuration to see if nothing has failed. I just wanted to thank you. I’ve installed odoo 10 twice using your script and it works flawlessly! I’m happy to hear you like it and that it helps you! Best of luck. Hi Yenthe, thanks a lot for this script! is there something to install on ubuntu 16? Sorry for the delay on the response. I haven’t had any problems on my Ubuntu 16.04 servers so I don’t think so. You might want to do an upgrade of pip (if you have/use it) and do an sudo apt-get upgrade. By default the users will be created without any passwords for security reasons. You’d have to set them yourself if you wish this. Hi Yahthee666, very nice script. I started study/using Odoo a few months ago and your guide has helped me a lot because in real 5 minutes you have a well made and installed instance. Thanks a lot! Odoo uses werkzeug as a webserver (see http://werkzeug.pocoo.org/ for more information). Hi Yahthee666, already using your odoo11 install.sh, work so beautifully, but how can I amend the script to work with downloaded enterprise package? You could install the community version, unzip the enterprise version, add it under a separate folder and then link to that folder in your odoo-server.conf file. Hi Yenthe666, Thanks for the help. It works perfectly. You’re welcome – happy you like it! Thank you Yenthe for the time spent in writing these scripts and the posts ! As you’ve already been told: you are a life saver ! Will this script run on Centos 6 or 7?? No it probably won’t as some commands and packages are different. You should really use this on Ubuntu. I’ve used your script to deploy Odoo v10. How can I append parameters to startup, or how to enable debug mode to troubleshoot some problems I’m experiencing when I enable workers. No you can’t. This script only makes one custom addons folder. If you want others you need to make them manually. Is there a way to automate the custom module updates on a linux server from github? to pull changes and odoo reconice that? Of course. You can create a shell script (for example) that you attach to a cron which updates the Odoo source code every once in a while. Thanks for the great script, saves al lot of time! What would be the right commands to update an Odoo 10 Enterprise edition? I have tried this script a countless number of times and it’ worked. But it seem not to be working on Ubuntu 18, can you check and see if there’s a fix. Don’t hesitate to create a new bug report if Odoo 10 does not work though. I am using your script from version 8 and its working 100% perfectly fine and saves a lot of time, in fact i have added many things in it as per my needs. I just have one question that if Odoo is installed using this script then can we have any way/command in which we can update a particular module using command line like for example something like. Happy to hear that! Actually the command you’ve added here is exactly the way to do it. You can call it from the service too. Hi Yenthe, I hope you don’t mind me asking a question about upgrading Ubuntu. I have Odoo10 Community installed on a Ubuntu 16.04 server. I would like to upgrade ubuntu to 18.04. if I run “do-release-upgrade” to upgrade ubuntu from 16.04 to 18.04, will it cause Odoo 10 server to malfunction? You should be fine with upgrading your Ubuntu to a newer version. Plan for a test run and a backup to be safe though!